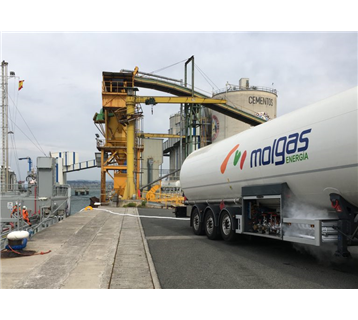 The Spanish Energy provider Molgas Energía bunkered 40 metric tonnes of the so-called ‘clean gas’ at the northern Spanish port, with more expected to follow, COO Juan Menchero tells Bunkerspot. The Spanish Energy provider Molgas Energía bunkered 40 metric tonnes of the so-called ‘clean gas’ at the northern Spanish port, with more expected to follow, COO Juan Menchero tells Bunkerspot. The LNG-fuelled cement carrier MV Ireland was bunkered in a tank-to-ship operation which lasted 5 hours on the 4 May. The bunkering follows a similar operation involving the cement carrier carried out at the neighbouring Port of Bilbao in March.